Based in Sweden, Australian ex-pat Sam is your doorway to Scandinavian sensibilities through an Aussie's eyes with her lovely blog Sam's Notebook. Sam lives in Malmö, Sweden, with her husband and two year old daughter. Her blog is a collection of finds online, from friends, from travel and from her local environment in Sweden. 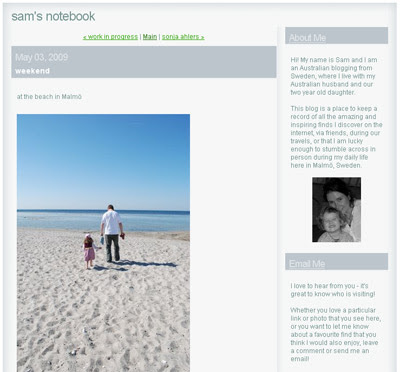 You'll find beautiful design ideas, recipes, craft, projects and ideas from Sam's inspiring lifestyle. Some of my favourite posts include photos of a weekend at the beach, and photos from real estate agents in Malmö. What a stylish city! Thanks Sam for such a lovely blog.